Powers/Abilities: A master warrior, Ashake is experienced in armed -- including archery and swordsmanship -- and unarmed combat. She is also an experienced equestrian. She rules an Empire, including its formidable army. Ashake's highest servants and the Sacred Spears, her house-hold cavalry, were all women. 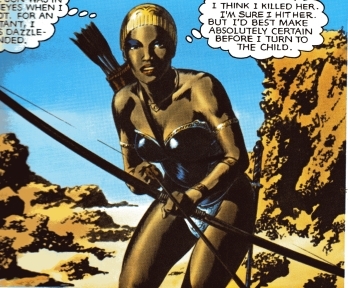 (Epic Illustrated#12 / Marvel Graphic Novel#21: Marada the She-Wolf (fb) - BTS) - As sport, Ashake regularly staged the Royal Hunt, where worthy warriors captured by her troops would serve as her prey. These warriors would be released, unarmed, into the desert plains with the goal of passing through the Mountains of the Moon, twenty leagues south. A squadron of cavalry would wait there for two days with horses, clothes, weapons, food, and gold. Departing two hours after the prey, Ashake would pursue them alone, armed with bow, arrows, spear, sword, and dagger. Those reaching the mountains in that time would gain their freedom, though none ever succeeded. Those refusing the Royal Hunt were made into slaves, while those participating were consistently slain by Ashake. 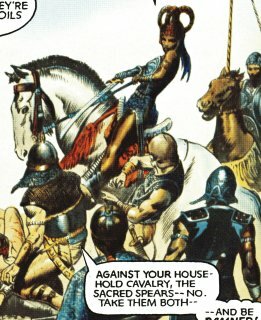 (Epic Illustrated#12 / Marvel Graphic Novel#21: Marada the She-Wolf (fb) - BTS) - In East Africa, a mercenary captain coerced Marada and Arianrhod -- who were trying to make their way back to Ashrandiar, on the rocky coast of England -- into joining their rebellion, part of an army of freebooters hired to seize the Lion Throne of Meroë from Ashake. 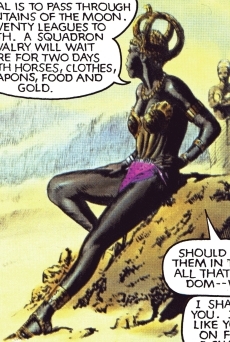 (Epic Illustrated#12 / Marvel Graphic Novel#21: Marada the She-Wolf (fb) - BTS) - On a morning in a dusty East African plain, Ashake's army ambushed the invaders. A bloody battle ensued, with the mercenary army getting slaughtered until eventually only Marada and Arianrhod were left. 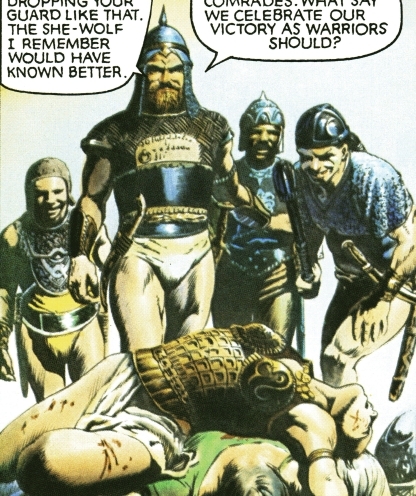 (Epic Illustrated#12 / Marvel Graphic Novel#21: Marada the She-Wolf) - Arianrhod and Marada both eventually fell. Ashake herself then showed up and stopped her soldiers from assaulting the unconscious women. Her captain, Keos, resented losing what he considered the rightful spoils of war, but realized he stood no chance against the Sacred Spears. Ashake had the two women taken to her castle and given drugs to help their pain, while the other surviving rebels were executed. 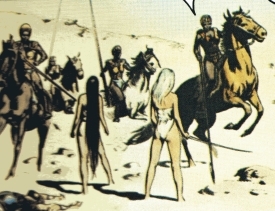 (Epic Illustrated#12 / Marvel Graphic Novel#21: Marada the She-Wolf) - Arianrhod healed Marada's injuries, after which Ashake's physician, Makede, check on the two women and was amazed to find them completely healed. 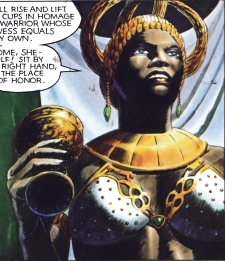 Ashake's chamberlain, Ntshonge, invited the women to dine with Ashake, who explained that they would either participate in the Royal Hunt or become slaves; if she moved against Ashake, the guards would slay them right there. Marada realized that she had no real choice, and so she agreed. The next morning, Ashake explained the rules of the hunt, and further noted that she had never failed to slay her prey. Marada and Arianrhod took off, and Ashake followed two hours later, sensing that at last the Royal Hunt would become the ultimate test it was always meant to be; she was unaware that Captain Keos conspired with other soldiers against her. After several hours, Ashake caught up to the pair and began targeting them with arrows. Marada pretended to take an arrow to the head in order to lure Ashake into a trap, then knocked her bow from her hands and stole her dagger. After a savage struggle, Marada overpowered Ashake, but then then Captain Keos, along with Casta, Inkose, and Macro, appeared, intending to slay Ashake and take command of Meroë for themselves. Arianrhod cast an illusion of a firebird to distract them, and Marada hurled her dagger into the soldier Inkose. As another soldier, Casta, rushed to slay Marada, she reached the fallen Inkose first and used her blade to gut Casta. Using Casta's sword, Marada then faced Keos himself. Fresh compared to his exhausted opponent, Keos managed to pin Marada's sword, but Arianrhod stopped him from using his dagger against Marada, enabling Marada to free her sword and stab Keos through the gut. Ashake herself slew the last traitorous soldier, Macro, after which Ashake's Sacred Spears arrived. Recognizing that Marada almost certainly had saved her life, Ashake pronounced her and Arianrhod honored friends. Marada considered continuing her battle with Ashake but decided to instead accept her hand and part as friends. 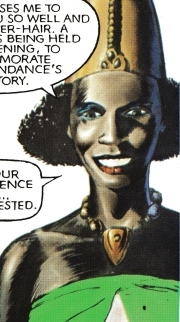 Further, Ashake refers to herself as Lioness at least once, perhaps indicating some connection to the legendary Amra, the leonine warrior whom Conan was believed to be by many of the Black Coast of Kush (Hyborian Africa). Meroë was also the name of the capital city of Kush. One of the soldiers allied with Captain Keos in an effort to slay Ashake and usurp her power, he was slain by Marada with a slash to the belly using the sword she took from Inkose after killing him. Casta is the man in brown helmet to Keos' right. One of the soldiers allied with Captain Keos in an effort to slay Ashake and usurp her power, he thought it best to slay Ashake before she departed on the Royal Hunt, but was instructed otherwise by Keos. After ambusing Ashake, he was caught off guard by Arianrhod's phoenix illusion and slain by a dagger to the throat hurled by Marada who then used his sword to slay another traitor, Casta. 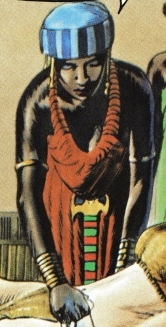 Inkose is the black man to Keos' immediate left. Captain of Ashake's army, he chafed under Ashake's orders (such as forbidding him to assault the bodies of the fallen Marada and Arianrhod) and led three other soldiers to try slay Ashake and usurp her power. He may have been the one to knocke Marada out initially when she was distracted by Arianrhod's injury. Though Inkose wished to slay Ashake before she departed on the Royal Hunt, Keos thought to wait until she had exhausted herself in pursuit and battle. He managed to pin the exhausted Marada's sword with his own, but Arianrhod grabbed his other arm to stop him from using his dagger against Marada, enabling Marada to free her sword and stab Keos through the gut. Keos is the central, bearded man. One of the soldiers allied with Captain Keos in an effort to slay Ashake and usurp her power, after his traitorous compatriots had fallen, he begged Ashake for mercy, and she granted him the mercy of a quick death, with a sword slash to the face. Macro is the guy with the pony tail, to Keos' far left. Physician to Ashake, she was instructed to tend to Marada's wounds as if they were Ashake's. She was astounded when Marada's wounds had suddenly healed.